The Tour Championship is a new event on the calendar, featuring only the eight best players on the one year ranking list. This event was played in Llanduno, North Wales, from March 19 to March 24, 2019. The QF were best of 17, the SF best of 19 and the final best of 25. Grove had two players in it: Judd Trump and Neil Robertson. Both got past the first hurdle. Judd went out to Ronnie O’Sullivan, the eventual champion. Having beaten Ronnie in two finals already this season, Judd faced an opponent who was absolutely determined to avert an other defeat. It was a hell of a battle over 19 frames. It went the distance. Ronnie eventually prevailed in a match that was extremely high quality. The two are savage potters, but it was the safeties that were key to the encounter and they both showed tremendous skills… and will to win. Having beaten Judd in a decider in the semi-finals, Ronnie then went on to defeat Neil in the final, by 13-11. The match was good standard, but not absolute top standard. It was however a battle of two players giving it their all under pressure. It was engrossing. Neil had been beaten 10-4 by Ronnie only two weeks ago, this time is was very close! 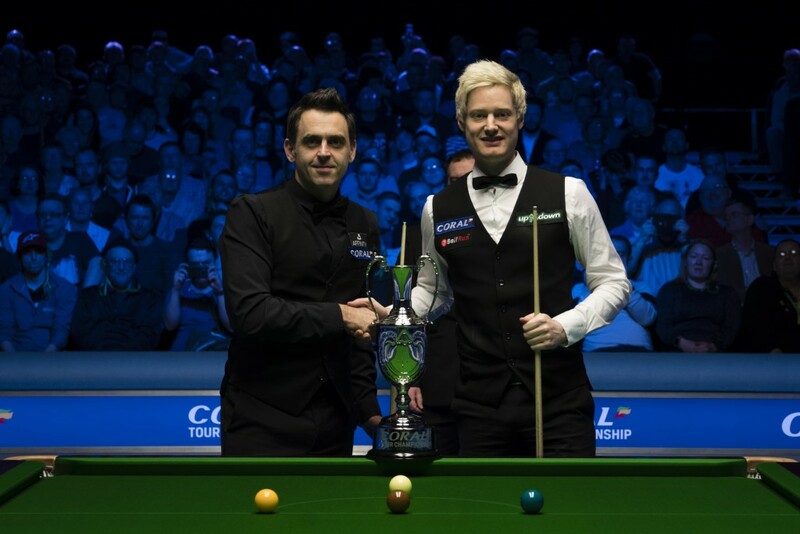 2019 Tour Ch'ship: review of the Ronnie O'Sullivan – Neil Robertson match (Session3, trophy ceremony) from MUU 907 on Vimeo.